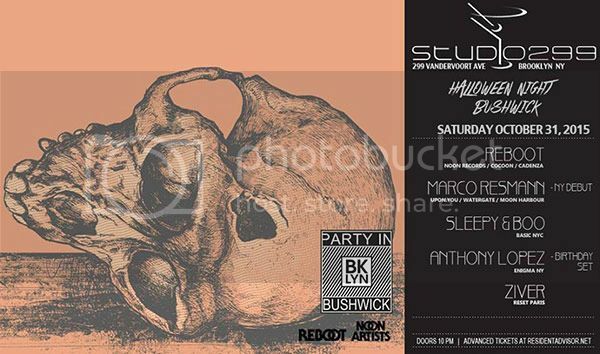 After a successful long-awaited debut of Bushwick’s newest club featuring a brand new Funktion One sound system freshly unpackaged, Studio 299 comes again strong with an astounding array of talent for none other than everyone’s favorite party holiday, Halloween! With a few adjustments to the sound, lighting, and décor as well as immersive visuals provided by Funk Taxi; Studio 299 will be alive and ready to wake up the dead? There is the uppity and pretentious scene of Manhattan, the hipster and eclectic scene of Williamsburg, and then there is the artistic and creative scene of Bushwick. Bushwick was voted the 7th coolest, most stylish neighborhood in the world by Vogue magazine and for good reason. The streets are aligned with photogenic graffiti and street art as well as artist galleries and lofts featuring some of the best art in NYC and the world. Bushwick is the only place to go to on Halloween where you can view handcrafted costumes from some of the most creative folk in the world. Seeing costumes in this locale from costume direct or party city will be a rarity. If the location and crowd of this soiree aren’t enough, then you can feast your ears on none other than one of Germany’s finest, Reboot. Reboot has been in the game since he was a small child, saving up pennies to purchase studio equipment. His tough and rugged techno is influenced by a mixture of classic house, world music, and jazz. He will purvey what he calls a “complex polyrhythmic architecture” on the brand new Funktion One Evo 7E high intensity loud speakers to entertain the creatures of the night. Marco Resmann maybe unknown to some but prior to Halloween night, he will have visited Bali, Melbourne, Brisbane, Sydney, Brazil, Amsterdam, Miami, Mexico City, and Los Angeles in the month of October alone. Having been behind the decks for over 15 years, Marco simply followed his passion because he was simply terrible at anything but producing and DJing. He went on to assist in the career of Matthias Tanzmann and become one of the original members of Pan-Pot before allowing Tassilo and Thomas to continue on as a duo. He is also one of the members of Luna City Express along with Norman Weber and co-founded Upon You Records along with Marcus Meinhardt and Hawks Grunert. In addition to all his massive accomplishments, he has also been able to withhold a residency at one of the world’s most infamous venues, Watergate Berlin since the latter part of 2006. New York residents and talent connoisseurs and founders of Basic NYC, Sleepy & Boo will be joined by Anthony Lopez of Enigma NY and Ziver of Reset Paris. Sleepy & Boo have made their mark on the scene by curating top-tiered talent from all over the world having organized and hosted parties at NYC nightclubs such as Sullivan Room, District 36, Marquee, Cielo, and plenty more. They have also been seen on the bill at New York festivals such as Electric Daisy Carnival, Electric Zoo, Escape Music Festival, Hyte Festival, Dance Here Now Festival, and many others. Studio 299 is an eclectic entertainment venue located on the border of East Williamsburg and Bushwick, Brooklyn. Valuing the communal environment and making it a key point to give back to the community, Studio 299 embraces all walks of life and plays host to a multitude of events. Acting as a full bar, lounge, restaurant, and nightclub; Studio 299 features two rooms of state of the art sound and backyard. Enter inside Studio 299 and you will find yourself immersed in sound and encompassed by the overall aura and atmosphere. A full bar is located on your right with granite countertops that wraps around the side while you’ll notice flat screens embedded in the burgundy colored walls surrounding the entire establishment. Projection screens protract downwards to display spectacular visuals while white leather couches reflect the state of the art lighting system. We welcome freedom of artistic expression from performers, musicians, artists, DJs, producers, the surrounding community, and those that visit from all around the world.